With the calm winds and low currents we headed decided to “hit the banks” in Area 7 this past weekend. The bite was fast and furious with some nice size kings. No monsters, but great table fare. The lure of choice was the new Silver Knight 3.5 with a big red eye (looks like a wounded herring !) . The Scotty’s were set just off the bottom with most of the fish hooked up 10-20 feet off the deck. Only a few more weeks to go… see you on the water! The immature Chinook salmon fishing has been fair overall at about 1 salmon per fisherman recently. Trolling in about 130’ to 150’ of water along the southern end of Vashon Island from Pt. Dalco to Quartermaster Harbor and the Slag area in about 150’ to 180’ of water. We have seen fish up to 8 plus pounds. There are also some releases of just under legal blackmouth reported as well. Salmon fishing was FAIR near Becher Bay. The best fishing was from Beechey Head and Aldridge Point. The fish are still quite deep and 120’ to140’ is the most productive depths. The hatchery marked fish have been as large as 15 lbs. Anglers are mostly using hoochies and spoons for lures, but many are switching over to anchovies. Good spoons have been Skinny G’s, Coho Killers and Coyotes with glow on them. Needlefish hootchies in White, Glow/Green and Purple Haze are the top choices in plastic baits. Anchovies were working too and good colours for teaser heads are Chartreuse, Tiger Prawn and Bloody Nose. The GIBBS Highliner Guide Series Outfitters, the Bon Chovy, and Gold Fever Hot Spot flashers have been working well. Fishing was SPOTTY in Oak Bay. Anglers have reported springs on the Flats in 80-140 depths. Trollers had been catching the salmon trolling small spoons; Coho killers, Wee G’s and 3” AP Tackleworks Herring spoons. Most of the anglers have been bottom bouncing spoons and squirts close to the bottom. Best bets for Oak Bay trolling lures are Wee Gs, Coho Killers and 3“AP Tackleworks Herring spoons. Squirts will also work with Jelly fish and Electric Chairs good bets. Jiggers are using Deep Stingers and Point Wilson Darts. 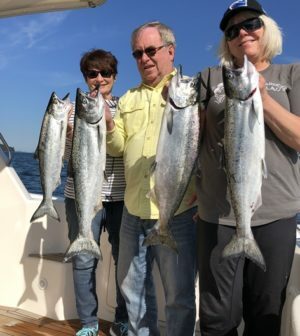 Pedder Bay Marina reports FAIR salmon fishing at Pedder Bay. The hot spot was again near the Navy can buoy at the mouth of the bay. Mike berry landed a beautiful 82 cm, 16 lb. hatchery spring on a Lemon/Lime AP Tackleworks anchovy spoon by the bay. Coyote style spoons have also worked well as the fish are targeting herring more than needlefish. Anchovies in green glow teaser have also been effective. Good choices for teaser head colors are Bloody Nose, Chartreuse and Purple Haze. Hootchies and squirts are still working with green and glow, Purple Haze or UV white good color choices. Flashers that are popular include the Guide Series Madi, Bon Chovy and Lemon Lime. Salmon fishing was FAIR in the Sidney area. We heard that there were springs from 12–18 lbs. coming from Coal Island and Moresby Island. The salmon fishing was VERY GOOD in Saanich Inlet, especially near Wain Rock Most anglers are using Skinny Gee spoons or anchovies. Suggested spoons are Coho Killers, Gibbs Skinny G and Wee G spoons and AP Tackleworks Sandlance spoons. Suggested colours are Cop Car and Trap Shack. Anchovies and Tiny Strip were also good in Glow or UV Purple teaser heads. Salmon fishing was FAIR this past week, but it was another week of not many anglers fishing for salmon. Most anglers were targeting halibut instead and were having a little success with the big flatfish. The best salmon fishing was near Secretary Island and Otter Point. The fish have been close to the bottom in 100-150 feet depths. Spoons such as Skinny G’s, Coho Killers and 4″ Coyote spoons have been good. Green and glow has been the hot color combination for spoons. Hootchies in White, Glow/Green and Purple Haze are the top choices in plastic baits. Anchovies and herring have been good as well. Good choices for teaser head colors are Chartreuse, Tiger Prawn and Bloody Nose. Popular flashers have been the Delta Guide Series UV Moon Jelly, the Bon Chovy, the Madi and the Super Betsey. Overall, salmon fishing was GOOD on the bank this past weekend. The fish were not on the top of the bank but a bit deeper and to the side. Most of the springs were from 7-9 lbs. with in the low teens. Closer in along the waterfront it was SLOW for springs with the most productive area being from Esquimalt to Brotchie Ledge. Most of salmon have been from 4-6 lbs in size. Anglers are trolling close to the bottom in 80 to 140 feet of water. Anchovies and herring are working the best and glow teaser heads have been better than the non glow colours. Spoons are working very well with Skinny G’s and Coho Killers in Irish Cream, Outfitters and the AP Tackleworks 3” herring spoon good choices.